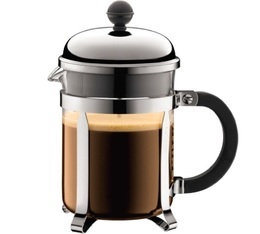 The French Press (also called a coffee press or coffee plunger) is dominated by the famous Bodum Chambord cafetiere. The French Press is a good way to discover Slow Coffee (slow extraction). Discover a large range of French Press in different sizes, containers, colours and brands. 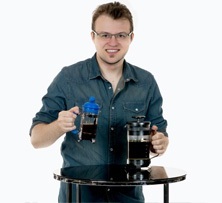 We'll show you our tricks for making a great coffee with a French Press! Discover this Trendy French Press coffee maker by Bialetti. It makes 8 cups, or 1 litre of coffee. 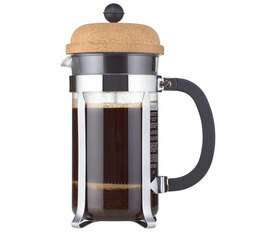 1 litre Bodum Kenya French Press coffee maker. New model. This black BRAZIL French Press coffee maker stands out with its vintage design and the BODUM logo on its base. This creamy white BRAZIL French Press coffee maker stands out with its vintage design and the BODUM logo on its base.